Do y’all know Jessica (no not me Jessica, the other Jessica) from How Sweet Eats? Who am I kidding…of course you do. Well, in case you live under a rock, Jessica is having a baby and a bunch of us bloggers are celebrating with an online baby shower! 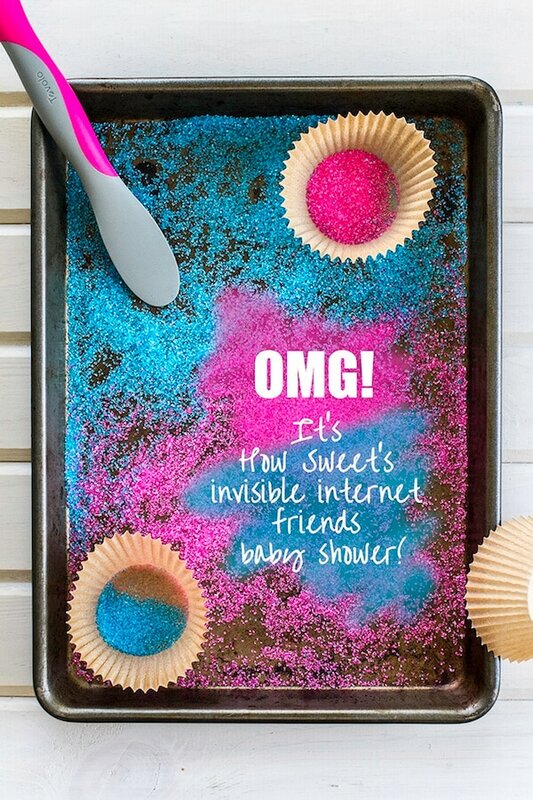 Sure online showers are a little strange, but us bloggers are a little strange too. You benefit from our strangeness with 65 amazing recipes (scroll to the bottom for the complete list of recipes) from 65 bloggers that are perfect for the next time you have to host a shower. Score! I became internet friends with Jessica many, many years ago. I finally met her in real life in Seattle a few years ago with Tina and we sat around gossiping and chowing down for hours. She is the exact same in person as she is on her blog and I absolutely adore her. Here we are in California with some other great food bloggers who are almost all celebrating Jessica today too! 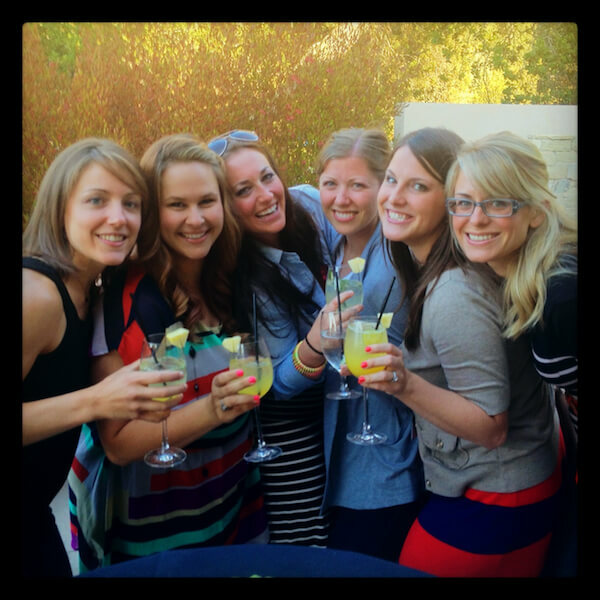 First up Ashley of Edible Perspective — Me — Jessica of How Sweet Eats — Lauren of Lauren’s Latest — Tina of My Life As A Mrs — Jenna of Eat Live Run. Funny note – in this photo only one of us, Lauren, was a mama. Now 2 and 1/2 years later and 5 out of 6 of us are! Wow! So when I found out she was pregnant, I couldn’t wait to find out if she was having a little girl or boy. Turns out, she could wait and is waiting to find out! I can’t imagine doing that. Jorge and I paid extra to find out at 14 weeks that Lyla & Ellie were girls. I have absolutely zero patience! I knew I wanted to use some of the homemade apple cider I picked up last weekend in my cocktail/mocktail, but I didn’t imagine it would turn out this good! I really love the flavor combo you get with apple cider and fizzy ginger ale/beer. 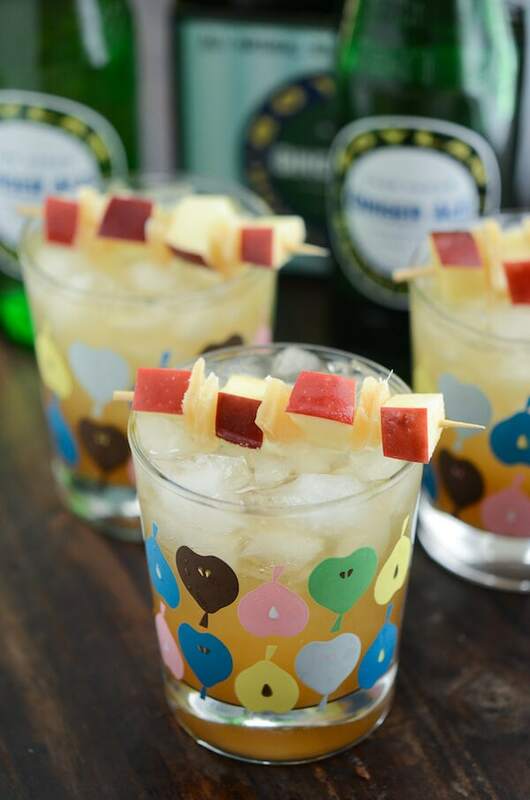 To dress up an otherwise plain looking drink, I skewered some apple and candied ginger and I love the way it came together. Cheers on your little bebe, Jessica! I hope being a mom makes you as happy as it has made me! Mix apple cider and bourbon and pour over crushed ice. 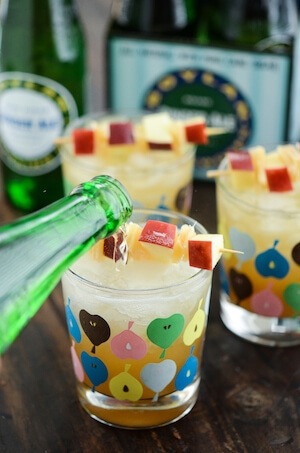 Add ginger beer and garnish with candied ginger and apple. Serve immediately. Make sure and check out all 65 amazing recipes from bloggers all over the internet! Next Post » Top 12 Cookies for a Cookie Exchange! I’ve been making apple cider/bourbon drinks like crazy this fall and now I have another one to add to my arsenal! Wish I had a glass of this right now. It’s the perfect way to celebrate Jessica (the both of you!). Hooray for boozy shower drinks! This is amazing! I want some. Thank you for being a part of this! oxoxox. something bubbly for the most bubbly of us all!! I love it!! Mmmm love me a cocktail with ginger beer, which I usually associate with warmer weather. I love that the bourbon and apple cider make this totally fall-worthy! Congrats to Jessica! You had me at ginger beer!!! Love apples + ginger! Perfect for fall and super cute glasses! oh how I would absolutely love a glass of this right now! 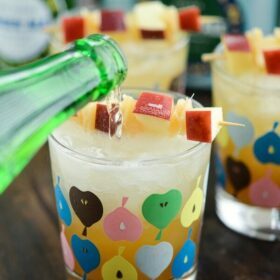 Ginger, bourbon and cider are basically my three favourite things, so I’m all over this drink! And I love that photo of all you guys. Super lovely people there, that’s for sure. Such a yummy looking glass! This looks fabulous! This sounds ridiculously refreshing – love it!! 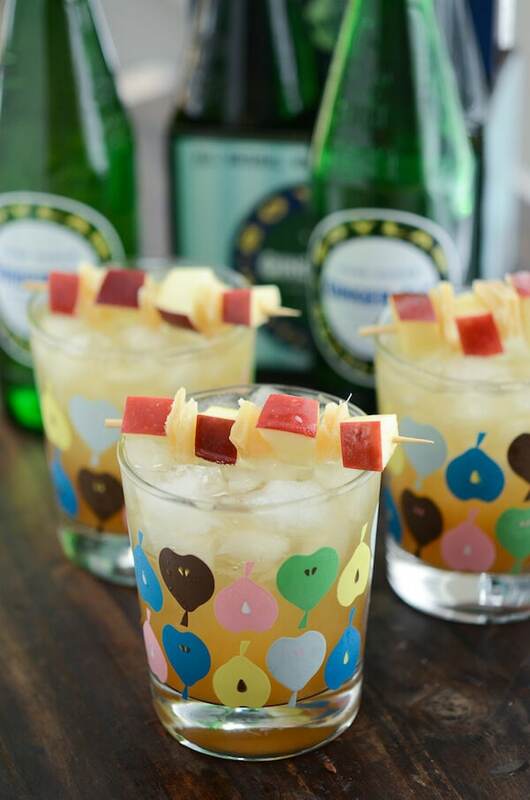 What a great fall cocktail! I am seriously loving this drink! And those glasses! Yum!! Just showed this to hubby and he is seriously contemplating a late night run out to the Supermarket to get some apple cider and ginger ale… I am not so subtly telling him what an awesome idea that would be. Can’t wait to try this! Really gorgeous pictures. 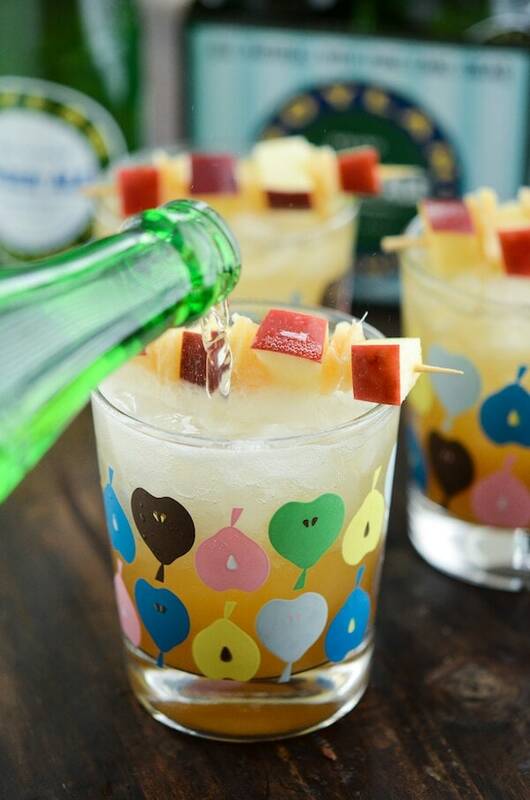 I made this ginger bourbon apple cider for the super bowl party and it was a crowd favourite. Simple to make! I’m also gonna pin this post on my Pinterest board my followers will love it. Thanks for sharing Jessica! Really this would be special and great ginger bourbon apple cider, Jessica! Love cider! Thanks for sharing! 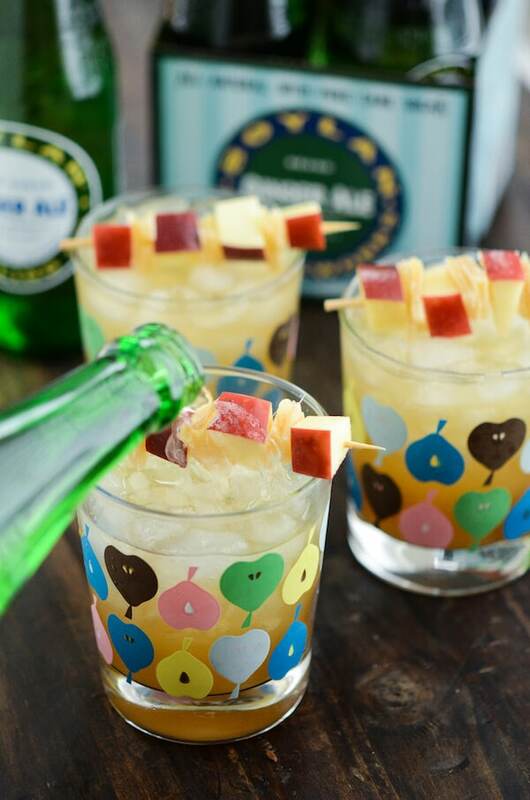 This ginger bourbon apple cider is so Instagrammable and adorable! As you know I made it a short while ago and it was lovely! Thx for sharing!